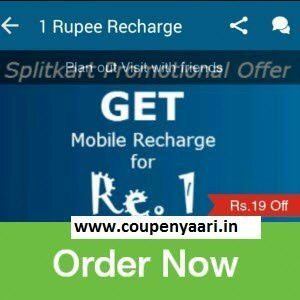 Recharge will be done on the Splitkart Users registered mobile number within 1 working hour. Ever faced the problem of awkwardness of sending out IOU mails/SMSes after an outing? Splitkart is designed to remove this awkwardness and create a fun-filled experience of outings with friends and colleagues. Splitkart app makes it easier and more fun for groups to plan out their outings at restaurants, avail the best deals and discounts at restaurants, split bills on the spot and pay from their mobile as well as to share and cherish the moments on Social Media. 1) Best Restaurant Deals and Discounts: Now get the best deals on restaurants in the NCR region using the Splikart Mobile App. Restaurant brands offering coupons and deals include Pizza Hut, Chicago Pizza, My Bar Studio, Moonshine Cafe, Rigo Restaurant, Hamburg to Hastinapur, Qash Restro and Bar, Telegram the Postal code, Beliram Degchiwala, Slice of Italy, High on Burgers, Moti Mahal Delux, Café 101, Nature Hut café, Waza and many more. 2) Platform to create groups and discuss about offers: The Splitkart In-App chat functionality gives you the option of chatting with your friends and family. People can plan their dinner outing using the Splitkart chat functionality by creating groups and discussing the offers and restaurants. Groups can also pictures and videos of their outing on the chat. 3) Easy Splitting option: The Mobile app provides the option of splitting the payment at the point of transaction. The restaurant would initiate the payment to the one person in the group. The person would receive the payment request and can either pay the full amount or split it among the group member using the easy to use splitting functionality. If the person splits the payment among the group, each member of would receive a message for payment. Once the payment is done by each member using Splitkart, the restaurant will receive a message confirming the payment. The bill split among group member can be done equally or each member of the group can be assigned a different amount. 4) Mobile wallet payment option: Now whenever you go to your favourite restaurant you need not pay by cash or card. You can simply use the Splitkart mobile app to pay through your mobile phone. Payment through the Splitkart mobile app is done through the PayU Money Wallet. More Payment wallets would be added soon. 5) Easy Social Media sharing options: Now share the restaurant deals or restaurant check-in with your family and friends on social media with just few clicks. We have integrated several social media platforms like WhatsApp, Facebook, Google+, Hangout, Gmail, Skype, etc. Note: The restaurant deals available on the mobile app are for the NCR region at the moment. Splitkart would be adding deals for other cities in the coming weeks. Refer and earn upto Rs.800 on refering the Splitkart app.